One of the finest kits that we've produced! 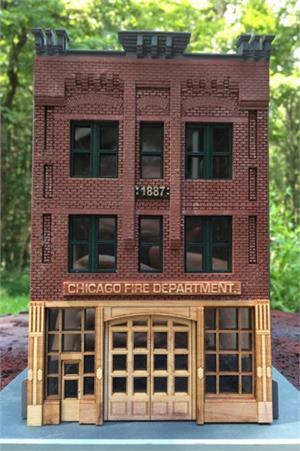 Circa 1887 for this Chicago firehouse in S Scale. Simple to build, complete directions,for the moderately skilled hobbyist! This kit has styrene partially engraved brick walls that have laser cut room for windows. The facade is laser cut basswood with cast resin cornice. Removeable roof. This kit is highly detailed with a rear fire escape.